Three goals in nine second-half minutes helped Inverness CT to an emphatic win that ensures a seventh-place Premiership finish. Miles Storey broke the deadlock when he escaped the offside trap and rounded Scott Bain before netting. Danny Devine tapped home at the back post from a corner before Ross Draper capitalised on Julen Etxabeguren's error to fire home. Richie Foran added a late penalty after Liam Polworth was tripped. Dundee knew before kick-off that they needed a win to leapfrog their hosts and finish top of the bottom half of the table. Both sides named unchanged line-ups, with Danny Williams making his last appearance for the home side before joining Dundee this summer, alongside team-mate James Vincent. Dundee's Paul McGinn is out of contract this summer and looks likely to depart with a number of sides apparently keen on recruiting him. If possession won football matches the home side would have been out of sight in the opening quarter. Iain Vigurs wasted a great chance with a tame free-kick from the edge of the box and two long-range Greg Tansey strikes landed safely in Bain's arms. Dundee initially struggled to get on the ball but came closest to an opener on the counter when Greg Stewart combined with Kane Hemmings before curling a great effort from outside the box which unluckily clipped the bar. Rory Loy fired wide, Hemmings fired over with a clear sight of goal and McGinn watched Owain Fon Williams parry his effort clear as the visitors threatened. But Inverness again took control in the second period with Williams seeing a close-range shot blocked, while another long range effort from Tansey was held easily. The match needed a moment of inspiration. It arrived when Storey timed his run well to go clear. Despite being forced wide by goalkeeper Bain, the striker found the angle to net his 13th of the season. It all fell apart for Dundee. Devine tapped home at the back-post after a corner was flicked on before Etxabeguren inexplicably lost possession on the edge of his own area and Draper fired past the exposed Bain. It got worse after the home side introduced two popular substitutes. The departing David Raven had a rare outing and Foran came on and scored a convincing penalty after Polworth was tripped by Adam Black. Dundee were denied a late consolation when Craig Wighton's poke toward goal was superbly saved by Fon Williams. This was a fifth win in seven games for John Hughes' side, who might wish this was the start of the campaign rather than the end. It was a horrible end for Dundee, who are a better side than this defeat suggests. Match ends, Inverness CT 4, Dundee 0. Second Half ends, Inverness CT 4, Dundee 0. Attempt missed. David Raven (Inverness CT) header from very close range is just a bit too high following a set piece situation. Corner, Inverness CT. Conceded by Jesse Curran. Attempt blocked. Ryan Williams (Inverness CT) right footed shot from outside the box is blocked. Corner, Dundee. Conceded by Danny Devine. Attempt saved. Rory Loy (Dundee) right footed shot from the centre of the box is saved in the bottom right corner. Attempt missed. Iain Vigurs (Inverness CT) right footed shot from more than 35 yards misses to the right. Goal! Inverness CT 4, Dundee 0. Richie Foran (Inverness CT) converts the penalty with a right footed shot to the bottom left corner. Andrew Black (Dundee) is shown the yellow card for a bad foul. Penalty Inverness CT. Liam Polworth draws a foul in the penalty area. Penalty conceded by Andrew Black (Dundee) after a foul in the penalty area. Darren O'Dea (Dundee) wins a free kick in the defensive half. Foul by Ryan Williams (Inverness CT). Substitution, Dundee. Andrew Black replaces Paul McGinn because of an injury. Substitution, Dundee. Jesse Curran replaces Greg Stewart. Substitution, Inverness CT. Ryan Williams replaces Danny Williams. Corner, Inverness CT. Conceded by Scott Bain. Attempt saved. Carl Tremarco (Inverness CT) header from the left side of the six yard box is saved in the top centre of the goal. Substitution, Inverness CT. David Raven replaces Josh Meekings. Goal! 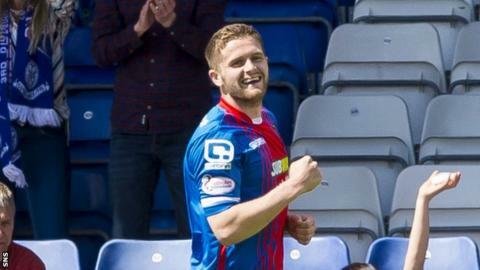 Inverness CT 3, Dundee 0. Ross Draper (Inverness CT) right footed shot from the centre of the box to the bottom left corner. Goal! Inverness CT 2, Dundee 0. Danny Devine (Inverness CT) right footed shot from the right side of the six yard box to the bottom right corner. Assisted by Iain Vigurs with a cross following a set piece situation. Corner, Inverness CT. Conceded by Julen Etxabeguren Leanizbarrutia. Attempt saved. Richie Foran (Inverness CT) left footed shot from the left side of the box is saved in the bottom left corner. Substitution, Inverness CT. Richie Foran replaces Miles Storey. Substitution, Dundee. Arturo replaces Calvin Colquhoun. Kevin Holt (Dundee) wins a free kick in the attacking half.